In the past, the primary aim of robotics and AI was the automation of manual tasks. Today, they are becoming an essential part of our day-to-day jobs. As they help us work more efficiently, the boundaries between employees and ‘machines’ becomes more blurry. “The result is a slew of new and exciting opportunities, but quite a few challenges as well”, explains Juan Staes, program manager workplace of the future at delaware. Natural Language Processing or NLP will open up completely new ways for employees to interface with day-to-day applications. For example, it will be possible to ask the CRM to present you with specific client information through chat or voice recognition. Need an update on the supply of raw material? A quick call to the ERP system suffices. RPA currently operates similarly to an assembly line robot, executing a predefined set of tasks. In the near future, it will be possible to infuse them with machine learning abilities. This will allow bots to ‘learn’ from human operators, allowing them to tackle increasingly complex tasks. Other possibilities include image recognition and text analysis. 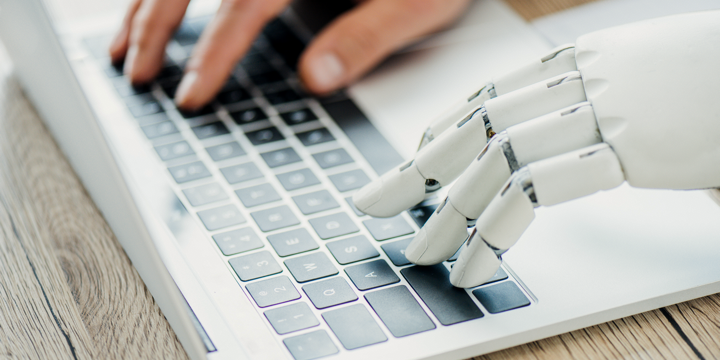 This combination of automation and artificial intelligence, called ‘intelligent automation’, will help organizations reach unprecedented levels of efficiency. Apart from these challenges, there are a number of challenges related to AI and robotics in the workplace as well. Here’s a few of them. From driverless cars to intelligent production machines, the question remains: if something goes wrong with a robot, who is responsible? For a long time, AI and robots have been predicted to ‘take over people’s jobs’. However, that really isn’t the case anymore. In fact, they support faster, more efficient, and more substantiated decision making. This mental shift will take some time to fully develop. A carefully managed transition and good communication are key. The ‘ratings’ logic of apps like TripAdvisor can be expanded to recruitment of consultants and job applicants as well. But the question is whether that’s actually allowed, not only in terms of privacy but ethics as well. How far can and should we go? Working with an exoskeleton, or with robots or AI in general, has a major impact on people’s on-the-job learning and training. This needs to be carefully considered as well. While huge technological progress is being made, the HR department – and other departments as well - needs to be willing to not only work with it, but fully embrace it as well. Involving the business in the discussion is essential. Whereas HR is currently using technology for mainly administrative purposes, it needs to think about new ways to make the most of the presented opportunities. This requires a proactive rather than a reactive approach. Want to know more about the future of AI in the workplace? Reach out to one of our experts. The AI-powered digital workplace helps employees to be more efficient while also boosting security and compliance.